Drumboe, in the morning rain. Rain all morning, dry later. This is the flower spike of Wood Dock - Rumex sanguineus. Three pathogens on Sycamore. Two early shots of the Sycamore Tar Spot - Rhytisma acerinum. And a leaf-gall made by a fly - Aceria macrorhynchus. At first I thought this was a moth, but as I looked more closely it said "Caddis-fly". 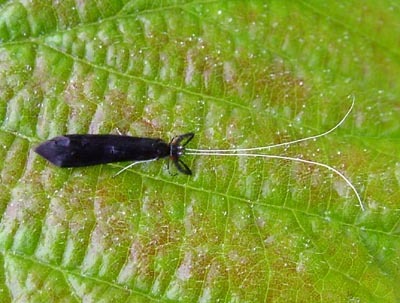 And sure enough a quick search led me to Mystacides azurea, one of the Silverhorn Caddis-flies. The nymphs live in water and make little cases for themselves out of small stones and sand grains. About 3 cm long, including the antennae. Drumboe is one of the few places locally that have a decent Sanicle population. Sanicula europaea.